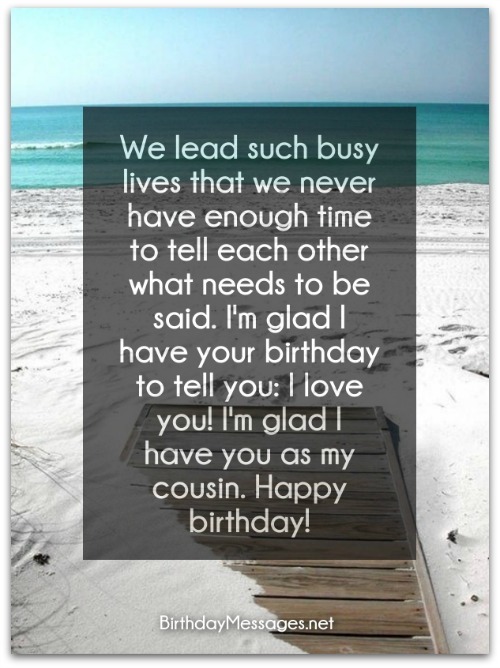 Cousin birthday wishes, like birthday messages for your brother, sister or close friends, are a wonderful way to show your cousins just how much they mean to you, something of which, due to our busy lives, is not always possible to do the rest of the year. 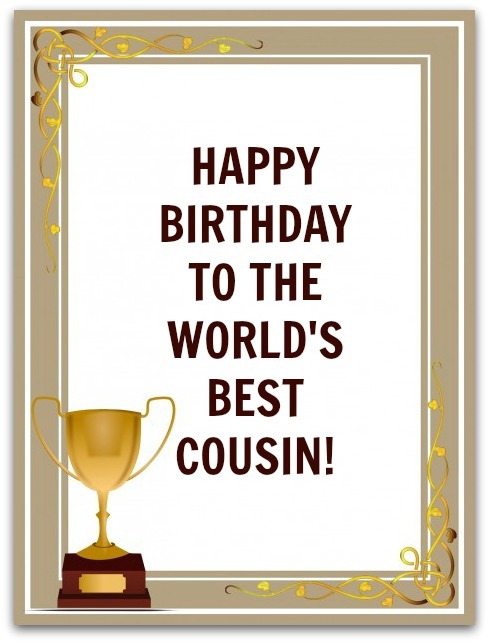 The best birthday wishes for your cousin have all the ingredients that make any birthday greetings so special: heartfelt birthday wishes that express how you feel about the birthday boy or girl, coupled with an inspirational, cute, clever, cool or funny message. If that sounds like what you have in mind for your cousin, look no further. That's the type you'll find on this page. Cousins are a very special breed — not exactly immediate family, but not distant relatives either. When the time comes to write a birthday message for one of your cousins, this very fact may have an impact on the route you choose to take. Either way, you need to realize that you have many types of cousins (and I'm not just talking about the difference between, first, second or third cousins). 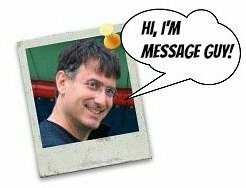 In an article I recently read, there were 14 basic types of cousins mentioned (from a personality standpoint), pretty much what you would find in any family. These are only suggestions. 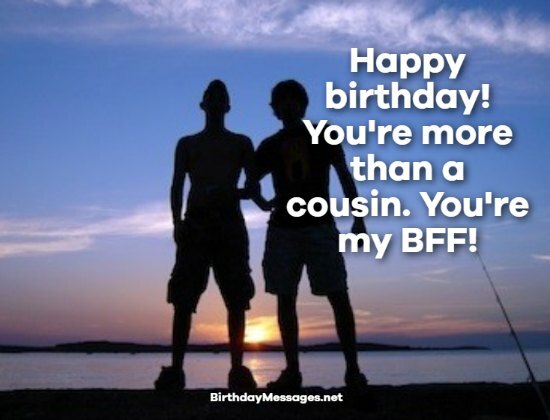 The actual cousin birthday wishes you end up sending are ultimately up to you and what you know about your cousins. And please feel free to mix and match the cousin birthday messages below to your liking. If you're one of the lucky few, you have two of life's greatest gifts in abundance: family and friends. With a cousin like you, I'm the luckiest person I know. You're family by blood and my closest friend by choice. Happy birthday, dearest cousin. What a blessing to have you in my life! As my cousin, you're the closest thing to a brother or sister. As my friend, you're the closest thing to a BFF. Happy birthday! You are not only my favorite cousin — you're also my favorite person in the world, a constant source of joy and wonder. Happy birthday! Happy birthday! If I had the power to choose every member of my family, you would definitely be at the top of my shortlist. That's because you've always been top-notch in my books! My dear cousin, I wish you only the best in life. You should only know happiness, health and prosperity the rest of your days, starting with this birthday. Hey cousin, I don't really need to wish you "happy birthday" since I'm certain that your birthday will be a happy occasion. That's because I'm going to be there. What could be better. Happy birthday to my dearest cousin. May every birthday you celebrate be a chance to start a new chapter in life. And may you have many birthdays — and many chances to start life anew — in the years to come. Happy birthday! Even though we're just cousins to the outside world, I consider you one of my closest friends in my heart. Don't tell the others but you are definitely my coolest cousin. May you have the coolest of birthdays! We lead such busy lives that we never have enough time to tell each other what needs to be said. I'm glad I have your birthday to tell you: I love you! I'm glad I have you as my cousin. Happy birthday! As a cousin, you are great! As my friend, you're the greatest. Happy birthday! Happy birthday, cousin! From the moment you came into this world, you've been the shiniest apple to hang on our family tree. That's why I love hanging out with you. I’m not only glad I have you as my cousin. I'm also glad I have your love, compassion, faith, wisdom, friendship and encouragement to inspire me. And I'm glad it's your birthday, so I can do the same for you! There are only three things I can wish for a cousin as special as you: more happiness, health and prosperity than you ever wished for...today and always. My dear cousin, may you have the happiest of birthday celebrations. That's my way of telling you that I love you very much. With an awesome cousin like you, growing up was the best kind of adventure. Whenever I think about you and our exploits, a flood of amazing memories come back to me. I remember every stupid, fun, exciting, precious moment. With this birthday, let's start creating new and wonderful memories. Happy birthday! Knowing I have a cousin like you to share my ups, downs and in-betweens is a gift few people have in this life. Happy birthday to the best cousin anywhere. No matter how many miles separate us all year round, I want you to know that you're as close to me as my closest friend. Being your cousin is one of the best things that ever happened to me! Happy birthday! The moments that we've spent together are some of the best I've ever had in my life. I‘m so grateful to have a cousin like you! May every moment of your birthday be as wonderful as you are! With a cousin like you, there's really no need for a best friend. Cuz, you're my best friend. Happy birthday! You are a very important part of my life. I'm so delighted to be part of your birthday celebration! I consider you my sister, not just a cousin. I really love you. Happy birthday!